Going to the local Drive In Movie Theater is a big part of my childhood memories. Joining hundreds of cars in the dirt parking lot, sprawling out in the back of the vehicle with our blankets, and watching the triple feature under the stars. Our Drive In was torn down years ago and I’ve missed that experience, an experience my kids haven’t had. 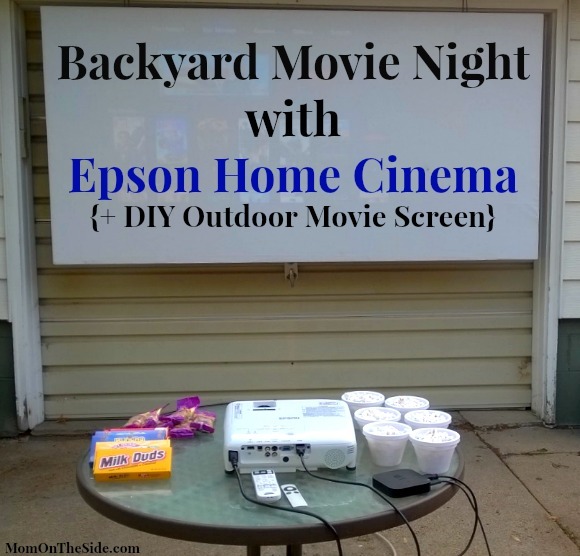 Until this past 4th of July weekend when we had a Backyard Movie Night with Epson Home Cinema and the DIY Outdoor Movie Screen we put together! Had I known that my own version of a Drive In right in my backyard or driveway was going to be this awesome….well I would have done it a long time ago! 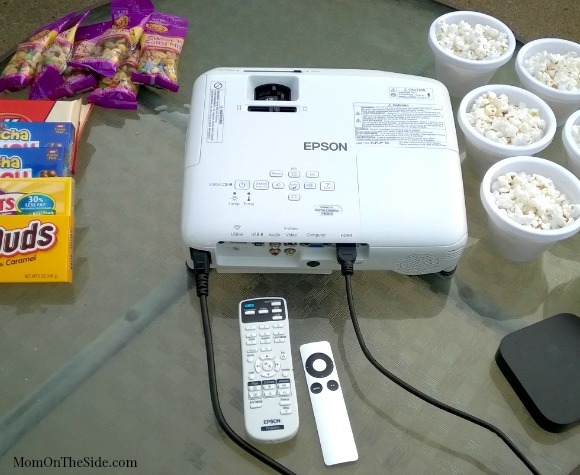 I honestly wasn’t quite sure how easy it was to setup and host an Outdoor Movie Night but let me tell you, with the Epson Home Cineam 730HD it was super easy! The Epson Home Cinema 730HD is a portable 3LCD projector delivering vibrant color, vivid clarity and immersive images up to 300-inches on virtually any wall or screen. Not only was setting up the Epson Home Cinema easy, but so are the controls. I haven’t had to do anything other than change screen size depending on if we are watching inside out outside. The easy-to-use digital image adjustment tools, HDMI connectivity and pre-set color modes for image optimization, make it easy to use for those that are tech savvy and not so tech savvy. With summer in full swing, what’s better than movie night with friends and family in the backyard? Whether you’re hosting a one-off celebration or planning on a series of outdoor movie nights under the starry sky, the portable Epson Home Cinema 730HD 3LCD projector provides a bright, big-screen experience with 720p resolution. With 3,000 lumens of color brightness and 3,000 lumens of white brightness1, the Home Cinema 730HD projects blockbuster movies, sporting events and larger-than-life videogames on the big screen with vivid clarity and color up to 300-inches, on virtually any wall or screen — indoors and out. What I really like about Epson Home Cinema is the portability. It’s light weight and small enough in size that you can take it inside or outside very easily. In under 5 minutes we had moved from indoors to outdoors, set up and were ready to go for movie watching outside. For us, and our love of Netflix and iTunes, we just bring our Apple TV outside with the Epson Home Cinema. It makes it super easy to access our favorite shows and movies, as well as purchase new releases. With easy set-up and installation, Epson Home Cinema compact projector is ideal for flexible placement whether in your backyard, on a rooftop or in the garage. 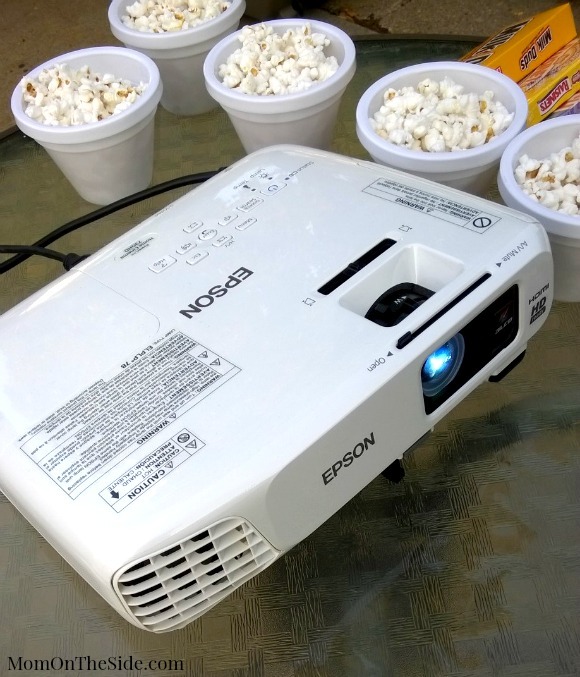 Featuring built-in sound, the portable projector allows you to easily place it on a table or even a fold-out chair for setup virtually anywhere in minutes. In addition, the projector comes with four pre-set color modes for image optimization and easy image adjustment tools, for placement in almost any environment. I’ve talked about how easy it is to set up and use, but let me tell you how impressed we are with the image quality of Epson Home Cinema. Both indoors and outdoors the picture is clear and vibrant. During the day we shut the curtains in the living room and are able to see just fine for indoor viewing. 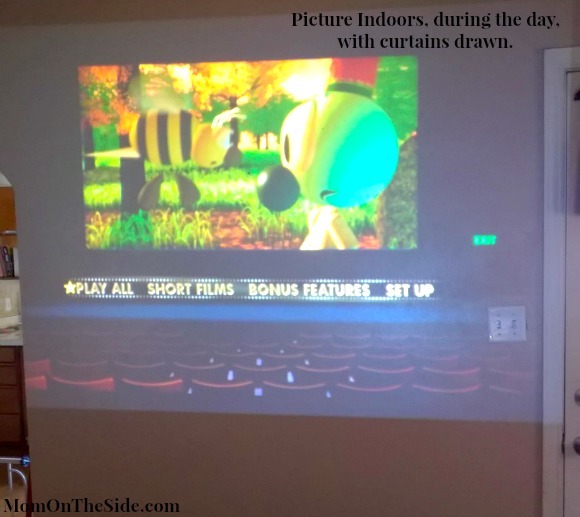 For outside movie watching Epson Home Cinema is fantastic! We got lots of compliments on the picture quality during our Backyard Movie Night for 4th of July. We started the movie shortly before sunset and were able to see the picture. It got progressively brighter as the sun went down and was awesome at night! My dad was about 18 feet down the driveway and could see the movie clearly. If you’re looking for a way to get everyone in the mood, the Home Cinema 730HD offers a range of features for entertainment beyond playing your favorite movies from a Blu-ray™ player. Simply plug in your device of choice – gaming console or laptop – through the HDMI port and enjoy larger-than-life gaming or project a slide show of photos with music as the crowd prepares for the featured attraction. 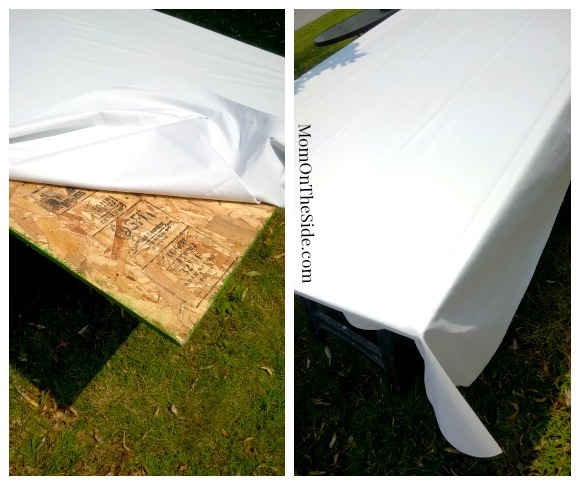 Building an Outdoor Movie Screen for your Backyard Movie Night is easier and more affordable than you may think! 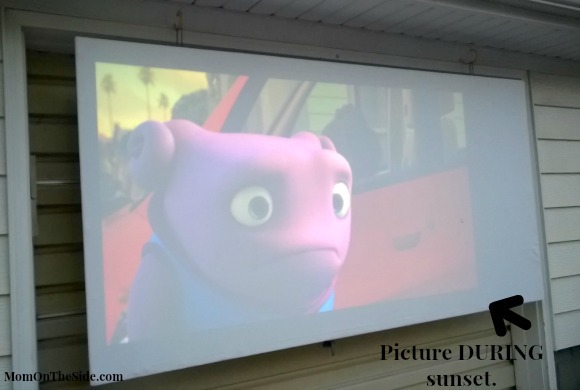 Hubby put together our DIY Outdoor Movie Screen in less than an hour and it works fabulously! We chose to hang our off the garage because of the way the sunsets, and the ease of getting the screen on and off for storage. 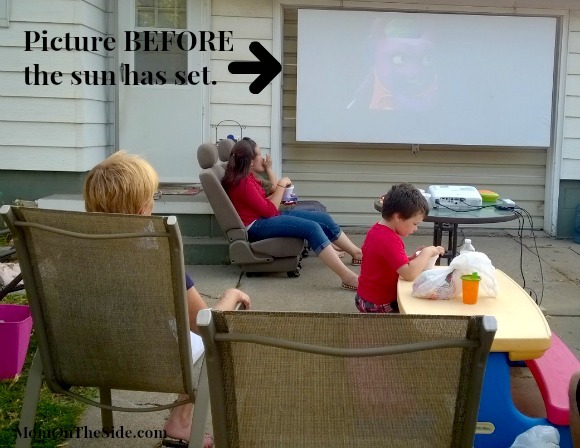 What are your tips for hosting a Backyard Movie Night?